Kaons are a type of meson—a group of extremely short-lived particles that mediate the strong force that binds protons and neutrons inside the atomic nucleus, consisting of an anti-quark and quark pair. The existence of mesons was first proposed by Japanese physicist Hideki Yukawa in 1935, and after they were discovered to exist he became the first Japanese to receive a Nobel Prize for his efforts. K mesons have recently become an important topic of research, as they usually exist as "virtual particles" that pop in and out of existence in the nucleus, but it might become real bound particle in a nucleus and become for a fleeting moment a part of an exotic nucleus, along with the typical neutrons and protons, since there is a slight time lag before the anti-quark and quark annihilate. Understanding how this happened could provide insights into mysteries such as the origin of mass and the quantum phenomenon of "color confinement." However, this state had never been observed in the real world. "What is important about this research," says Masahiko Iwasaki, the leader of the team, "is that we have shown that mesons can exist in nuclear matter as a real particle—like sugar that is not dissolved in water. This opens up a whole new way to look at and understand nuclei. Understanding such exotic nuclei will give us insights into the origin of the mass of nuclei, as well as to how matter forms in the core of neutron stars. 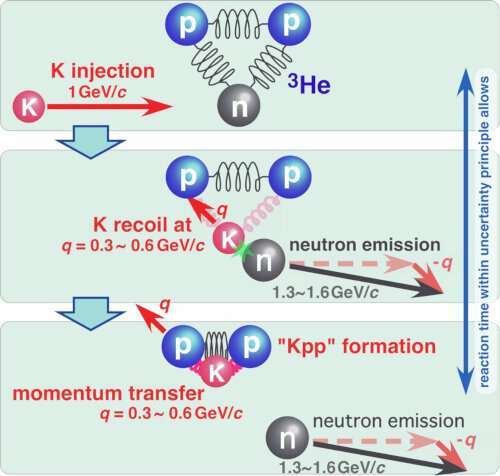 We intend to continue experiments with heavier nuclei to further our understanding of the binding behavior of kaons." What is the lifetime of this exotic nucleus? You never said. Doesn't matter what the lifetime is. They detected it. The paper is open access at the given DOI link. I read it. Did anyone else? Love to hear 'yes' from you. The more the researchers dig into it, the more it seems like matter was intelligently designed with highly logical fitting parts to it. There seems to be rules that need to be strictly adhered to in order to keep things from spontaneously falling apart, or worse just collapsing into one big blob of matter or black hole or spontaneously dissolving into energy. Where does the rules come from? Wow! I also got a duplicate comment to register. I thought it seemed strange yesterday when someone else got 5! So I'll just leave this here to brag. Not thinkin' @FreddyJoe read it. Well certainly not from a god who wrote a book full of lies. Maybe from some other being who didnt feel the need to make up stories about people who never existed and things that never happened. But most wouldn't be foolish to promise you immortality just for believing that their fiction was real. Well maybe L Ron Hubbard but besides him. That which you refer to as "Intelligent Design" is where the "Laws" and "Rules" were planned, formulated, came to fruition and, of course, all of the Rules are logical and reasonable ones - also a great achievement incorporating common sense. It is from the Intelligent Designer Himself that Nature and the natural scheme of things in the Universe had been decided upon, and then became reality. Matter and Energy are interchangeable while being subject to the Natural Laws and Rules which humans are in the process of discovering and often trying to circumvent.